All aboard for Christmas! There are trains and tinsel galore on our festive short breaks and escorted tours. A wonderful way to get into the Christmas spirit is to enjoy the atmospheric Christmas Markets that take place around the UK and Europe as the festive season approaches. This year we are offering a selection of unescorted short breaks and an escorted Christmas Market tour to get you in the Yuletide mood or you may wish to have a guaranteed ‘white Christmas’ this year by joining our annual festive tour to Switzerland and celebrate with fellow travellers. This seven-night holiday combines festive sightseeing and shopping with the opportunity to explore several steam railways in the Dresden area that survived the communist period and still operate a year-round service. Savour traditional Saxon festive treats in the heart of this Baroque city and enjoy optional escorted excursions to the Cranzahl and Oberwiesenthal, Zittau, Freital-Hainsbeg and Radeberg narrow gauge steam railways. The holiday also includes a public transport ticket for Dresden, enabling visitors to travel for free around the city and, for those wishing to venture further afield, an InterRail Pass. Departing 1 December, the price is from £1,120 pp (two sharing), including standard class rail travel throughout, an InterRail Pass for Germany which includes free travel from your home station to London, public transport ticket, B&B and the services of a tour leader from London and throughout the tour. Experience a guaranteed ‘White Christmas’ in the snow-capped Swiss Alps on this 14-day, two-centre visit to a true winter wonderland. Beginning in Interlaken (your base for seven nights), use the included first-class Swiss Travel Pass - giving unlimited travel on trains, postbuses, lake steamers, and many city buses and trams - to explore the beautiful Bernese Oberland region. Next, move on to the attractive lakeside town of Lucerne for further independent exploration using the Swiss Travel Pass and a four-night stay that includes a New Year’s Dinner in the hotel. Throughout the holiday, there’s also the opportunity to join optional escorted excursions that include Mürren, Zermatt and Rigi Mountain (reached by rack railway). Departing 21 December, the price is from £2,415 pp (two sharing), including standard class travel to/from Switzerland, first-class Swiss Travel Pass, optional escorted excursions, B&B (in Cologne, Interlaken, Lucerne and Mainz), eight dinners, and the services of a tour leader from London and throughout the tour. Known as England’s ‘Christmas Capital’, Hampshire’s county town is a wonderful place to visit as the festive season approaches. Surrounding its majestic Cathedral, you’ll find prettily decorated wooden chalets - inspired by traditional German Christmas Markets - selling interesting gifts and delicious food and drink, as well as a purpose-built ice rink. This short break also includes an excursion to the nearby Watercress Line steam train, an unforgettable hour-long rail journey through scenic countryside, washed down with wine and mince pies, and time to explore the market town of Alton or the nearby village of Chawton, home of Jane Austen. This three-night holiday costs from £350 pp (two sharing), including B&B in the four-star Winchester Royal Hotel, all rail travel to/from Winchester in standard class, and a ticket for the Watercress Line Steam Train, ‘Santa Special’. 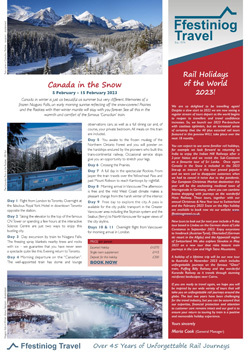 Available for departures between 1 and 20 December. This five-day holiday blends shopping at atmospheric Advent markets in the historic quarter of Freiburg with wonderful sightseeing in the scenic Black Forest and Rhine Valley. Spend your first day in the city browsing locally-made arts and crafts, before rising next morning to travel by train through the Black Forest to Seebrugg (past the three lakes of Titisee, Windgfällweiher and Schluchsee) and visit the spectacularly-situated Christmas Market in Ravenna Gorge. Held on Friday to Sunday afternoons only, the market is held right under the railway viaduct of the Devil’s Valley Railway in the Black Forest Highland. Next day, ride on the Schauinsland Cable Car (reportedly the longest gondola lift in Germany, at 3.6 km in length) for a 20-minute ascent to the mountain summit (1,220m) and breath-taking views across the Rhine Valley. This four-night holiday costs from £890 pp (two sharing), including all rail travel (Eurostar from the UK), InterRail Pass with seat reservations, B&B in the four-star Best Western Hotel in Freiburg, return journey on the Schauinsland Cable Car with cheese fondue lunch, and tickets for the tram network to/from Freiburg. Available for departures between 1 and 23 December. One of Europe’s oldest Christmas Markets and the very first in France (dating back to 1571), Strasbourg boasts over 300 chalet stalls selling arts, crafts and culinary treats. As well as superb festive shopping opportunities, this four-day break includes time to visit picturesque Colmar (half an hour away by train) and its traditional Christmas Market, as well as the city of Mulhouse, home to the largest railway museum in Europe, the Cité du Train. This three-night holiday costs from £820 pp (two sharing), including all rail travel (Eurostar from the UK), B&B at the three-star Hôtel Cathédrale and a Mulhouse City Pass, giving free admission into the ‘Cité du Train’ museum and free travel on the city’s tram and bus network. Available for departures between 23 November and 30 December. Click on the tour headings above to see the full day-to-day itineraries.